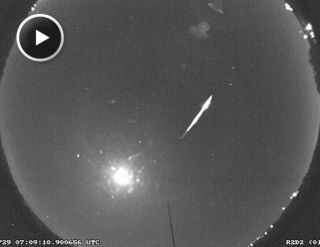 A fireball from a Southern Delta Aquarid meteor streaks over one of the network cameras in July 2010 in this still image from a NASA video camera. NASA has a new network of smart cameras to keep a robotic vigil on the roughly 100 tons of meteoroids that slam into Earth every day. As these fragments of space dust, gravel and rock enter the Earth's atmosphere they sometimes create bright fireballs or "shooting stars." Yet the question of where the meteoroids come from is largely unknown. A meteor might originate in the asteroid belt between the orbits of Mars and Jupiter, in a comet's death throes, or as a piece of man-made space junk. But NASA's new smart camera network is designed to solve that mystery. Researchers will use it to triangulate the fireballs' paths, and special software will then use the data to compute their orbits. "If someone calls me and asks 'What was that?' I'll be able to tell them," said William Cooke, head of NASA's Meteoroid Environment Office, in a statement. "We'll have a record of every big meteoroid that enters the atmosphere over the certain parts of the U.S. Nothing will burn up in those skies without me knowing about it!" Scientists have different names for space rocks depending on where they are. For example, small rocks and dust particles in space are meteoroids until they encounter Earth's atmosphere. If they burn up in a bright fireball or flash, they are a meteor. Any leftover pieces that actually reach the surface of the Earth are meteorites. "With our network, our computers do it for us – and fast," said Cooke, who is based at NASA's Marshall Space Flight Center in Huntsville, Ala. So far, the first three cameras in the network (each the size of a gumball machine) are already up and running. Cooke and his team hope to have 15 cameras deployed east of the Mississippi River soon. Eventually, NASA plans to expand the new camera nationwide and is seeking out schools, science centers, and planetariums willing to host the cameras. The instruments track meteoroids and their orbits, and provide data on meteor speed as a function of size. This will allow experts to calculate whether a fireball will plunge to Earth, and pinpoint the impact location fairly precisely. "And when we collect the meteorite chunks, we'll know their source," Cooke said. "I could be holding a piece of Vesta in my hand. It would be like a free sample return mission!" However, just knowing a meteoroid's path doesn't guarantee we'll be able to find it. "Most meteorites fall in the ocean, lakes, forests, farmer's fields, or the Antarctic," said Rhiannon Blaauw, an assistant to Cooke. "And the majority of those meteorites will never be found. But our system will help us track down more of them." "Go out on a clear night, lie flat on your back, and look straight up. It will take 30 to 40 minutes for your eyes to become light adapted, so be patient," he said. "By looking straight up, you may catch meteor streaks with your peripheral vision too. You don't need any special equipment –just your eyes."